The Alaska Marijuana Control Board released its first draft of regulation proposals for public comment on Oct. 5, speeding towards its Nov. 24 deadline. The public will have the opportunity to provide written comments on the first regulatory draft beginning Oct. 11, and have the opportunity for public comment at the board’s Anchorage meeting Oct. 15-16. Public comment and industry criticism of the draft regulations have focused on several issues, including limits on Outside investment, a prohibition on marijuana social clubs, limits for cultivators and retailers, licensing fees and requirements, and potency restrictions. Outside investment remains one of the most-discussed problems for much of the Alaska marijuana industry, both locally and nationally. Under the draft regulations, the board will not issue a marijuana license unless the shareholders and partners are legal Alaska residents, which requires a full calendar year of residency to establish. Anyone with a “direct or indirect financial stake” in the company must be listed as a licensee, and therefore follow the same residency requirements. The ban on Outside investment started a conversation about big business versus Alaska-first business versus federal drug laws. With high entry costs from license and testing fees, security requirements, and basic business expenses, already-wealthy Alaskans could dominate cannabis business while smaller competitors scramble for startup capital. Outside investment could narrow the gap between Alaska millionaires and mom-and-pop growers and retailers, but also bring in big competitors in the $3 billion national cannabis industry. Regulators, however, fear federal money laundering guidelines, and see Outside investment dollars as a possible route for dirty money from drug cartels or shady investors. Kris Krane, former executive director of the National Organization for the Reform of Marijuana Law, or NORML, said Alaska’s biggest hurdle is to workshop ways to allow Outside industry investment. Attracting the kinds of industry consultants and business opportunities available to Colorado or Washington, he said, depends on it. Alaska has no existing infrastructure of medical marijuana businesses like Colorado, Washington, and Oregon did when they legalized recreational marijuana. As a result of inexperience, Krane said the industry doesn’t fully comprehend the amount of investment capital needed to get businesses up and running. Board chairman Bruce Schulte noted that the board hadn’t gotten much input from stakeholders on possible solutions that would favor local licensees while allowing for Outside investment, and hopes to see creative solutions in public comments. The board’s most recent addition to the draft regulations prohibited marijuana social clubs, to public outcry from industry figures. Marijuana clubs, which do not sell cannabis but allow cannabis users to consume and share on premises, have been a legal gray area in Alaska. Use and possession of cannabis is legal, but business licenses for sale and cultivation will not be issued until May 2016. Cannabis clubs do not sell, manufacture, test, or cultivate, which Harriet Milks, assistant attorney general and the board’s legal counsel, said puts the entire business outside the board’s authority. The board voted in favor of the prohibition, meaning clubs will be illegal unless the Legislature creates a license type for them in statue during its next session. Milks characterizes it not as a ban, but as a simple declaration that board can do nothing without legislative action. 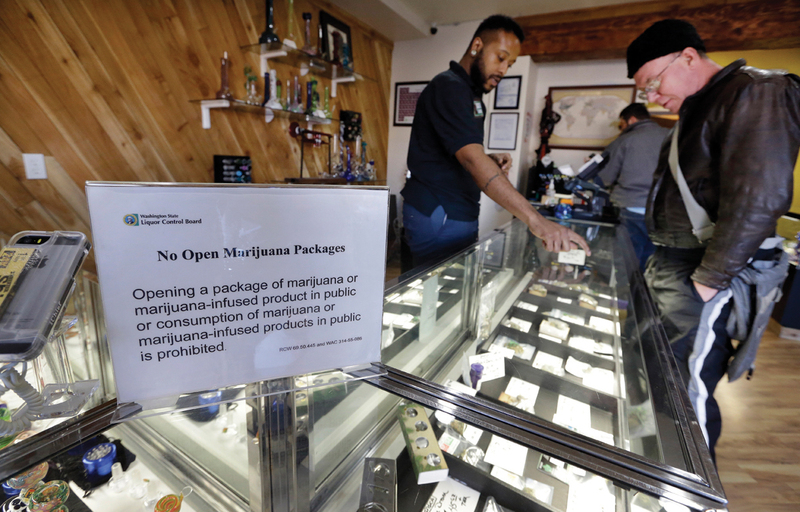 Marijuana industry attorney Jana Weltzin of the Rose Law Group called Milks’ characterization “legally incorrect,” as the prohibition clearly establishes a penalty for marijuana clubs. Weltzin, however, mentioned no plans about pursuing legal action against the board, echoing Schulte’s cautioning that the industry can’t afford any regulatory tangles on its current schedule. Licensing fees themselves roused some public ire; the board made changes to the fee structure on behalf of small marijuana cultivators. The board will issue four license types, one of which has two subsets. Retail, standard cultivator, and manufacturer’s licenses will all cost $5,000, while limited cultivator and testing licenses cost $1,000. Limited cultivators, however, are also required to perform all sales through a broker, and are forbidden from selling directly to consumers. On top of licensing and testing fees, industry worries the broker requirement will force boutique growers back into the black market as a cost avoidance measure. Potential marijuana product manufacturing licensees voiced concerns about a draft regulation that prohibits commercial kitchens from experimenting with marijuana products. Would-be marijuana confectioners will be required to rent their own commercial space, with the accompanying marijuana license. Manufacturers alone will be allowed to purchase marijuana concentrates with THC levels greater than 76 percent. Anything beyond 76 percent concentration is forbidden to consumers, which board member Brandon Emmett believes is a safety risk. Along similar edible lines, marijuana manufacturers dislike a proposed regulation that limits marijuana edible serving sizes to five milligrams – half the industry standard of 10 milligrams per serving. Because all edible products are limited to 10 servings apiece, this means customers will theoretically have to buy twice the amount, a boon to retailers but a disadvantage for medical users with high THC tolerances. Marijuana edibles, in fact, will be the only edible products available at retailers, in an effort to prevent convenience stores doubling as pot shops. The board passed draft regulations that prohibit retail cannabis establishments from selling cigarettes, drinks, snacks, coffee, tea, or anything consumable but non-cannabinoid in nature.